Research on the triplet state of molecules has been very active during the past twenty years and pursued by optical and magnetic resonance spectroscopists as well as by photochemists and photobiologists. The contribution of our group towards an understanding of the radiative, nonradiative, magnetic and structural properties of the triplet state has been extremely valuable and extensive. We have applied known techniques as well as developed new ones to obtain new fundamental information concerning the properties of molecules in the different spin levels of the lowest triplet state of prototype molecules. From the results on the polarization of phosphorescence, our group was the first to obtain detailed interaction schemes responsible for the previously known heavy atom effects on the phosphorescence properties. One of our papers was one of two that came out simultaneously introducing the method of "magnetophotoselection," now commonly used in triplet ESR research. In 1968, we began to develop the field of phosphorescence microwave double resonance. We showed how to use these techniques to determine the radiative, nonradiative, magnetic and structural properties of molecules in the different spin levels of the lowest triplet state. Most notably is our work in which we used the spin label of triplet molecules to determine the mechanism of the nonradiative electronic energy relaxation process from the lowest excited singlet state to the lowest triplet state. We showed that the effect of small magnetic field on the net spin polarization of the system at low temperature enables the determination of the mechanism of this important nonradiative process. We then applied this new valuable technique to elucidate the mechanism in a number of important systems. In N-heterocyclic systems, the results are found to be consistent with the selection rules we proposed over ten years earlier (The El-Sayed’s Rule:Wikipedia, the free encyclopedia) Using Stark effect on the double resonance signal, we were the first to measure and account for the difference in the dipole moment of some polar molecules in the different spin levels of the lowest triplet state. Using double resonance methods, we were the first to show that in some solid state photochemistry, the reactivity of molecules in different spin levels of the lowest triplet state can be different. During the past ten years, our group has been successful in using the different properties of lasers to develop new techniques and to study intra¬and inter-molecular dynamics in different systems, ranging from isolated gas molecules to the photosynthetic system of bacteriorhodopsin. Below a summary of the important contributions made during the past few years is given. Our group was among the first two groups to use two-color lasers and ionization detection to measure the lifetime of excited states and the ionization potential of molecules. In two-photon-multiphoton ionization spectroscopy, our group was the first to use polarization techniques in assigning two photon transitions of large polyatomic molecules. This technique was then applied to identify the type of the electron (p\ vs. nonbonding) having the lowest ionization potential in heterocyclic compounds. In laser multiphoton ionization-dissociation, a technique was developed to differentiate between mechanisms involving ionization followed by dissociation and those involving dissociation followed by ionization. In this technique two-color lasers are used and the time-of-flight mass spectrum is studied as a function of the repelling voltage applied in the ionization-extraction zone. Recently, by combining two-color picosecond laser techniques with mass spectrometry, our group was able to determine the rates of energy redistribution prior to ionic fragmentation in mass spectrometry. This technique makes it potentially more profitable to study energy redistribution in ions than in neutral species. In addition, it offers an experimental method to test the applicability of the quasi-equilibrium theory proposed in 1944 to describe the observed mass spectra of molecules. Using time-resolved laser luminescence line narrowing (LLN) techniques, the mechanisms of energy transfer between the same chemical species in different sites have been investigated in disordered solids. In pure solids with large inhomogeneous linewidth, it was shown that by changing the wavelength of the existing laser, the average donor-acceptor distance can be changed continuously if the energy transfer studies are carried out at 1.6\K. Using this technique, a careful distance dependence of the energy transfer mechanism in some of these solids at low temperature has been investigated. Our group was the first to demonstrate switching in an energy transfer mechanism with distance. Thus while triplet-triplet energy transfer occurs via an electron-exchange mechanism at short distances for 1-chloro-4-bromo-naphthalene solid at 1.6 K, a dipole-dipole mechanism dominates at distances larger than ~10. Our group has developed a number of techniques that enabled the determination of the resonance Raman spectra of transients formed in the milli-, micro-, nano-, and picosecond time domains. In each time regime, a different type of lasers (c.w. or pulsed) or a different technique of sample excitation (static vs. sample flow technique) was used. In the different techniques, the time resolution is limited by either the laser pulse width or by the focal volume and the sample flow rates. Using the microbeam flow technique with picosecond lasers, our group was the first to report the resonance Raman spectrum of a picosecond transient. The above techniques were developed in order to answer important questions about the mechanism of some photobiological changes. Bacteriorhodopsin, the second photosynthetic system in nature besides chlorophyll, was one of two systems studied with the time-resolved resonance Raman technique that we have developed. We were the first to show clearly that retinal conformational changes indeed occur in a time shorter than 50 ps. We have also shown that, unlike chlorophyll, intermolecular energy transfer does not take place in bacteriorhodopsin prior to photochemical changes, i.e., the absorption and the primary photochemical reaction (configuration) changes occur on the same molecule. In combination with optical time-resolved studies, the nature of the coupling between the retinal and the protein is examined. Recently, we have developed a simple technique using nanosecond pulsed lasers and a home built time of flight mass spectrometer to determine the rate of energy redistribution in molecules falling apart on the subpico-to-picosecond time scale. This is also the time scale for molecular rotation of some molecules. For these systems, an excited ensemble will have a distribution of lifetimes. The ones that dissociate immediately will have no time to redistribute any excess energy above bond dissociation into internal energy. The fragments will be anisotropically distributed and should have large recoil translation energy. Molecules that have time to rotate, before dissociation, will give fragments in different direction than those produced from rapid dissociation and will also have less recoil energies (as some of the excess energy is redistributed in internal energy during the time it takes the molecule to rotate). Thus by measuring the recoil energy of fragments detected along the laser polarization direction and perpendicular to it, the amount of energy that redistributes in a quarter of a rotation can be determined. In the actual experiment, the polarization ratio of the signal intensity of the fragments at different recoil velocity is determined and is related to the time dependent correlation function, from which the time dependence of the recoil velocity (and thus of the recoil translation energy) is determined. From the slope, the rate of energy redistribution is determined. The dependence of the rate of energy redistribution on the excited state structure of different molecules is examined. For smaller molecules (e.g. ICN, HgI2,) the dependence of this rate on the calculated potential energy surfaces and the effect of curve crossing is being studied. The evaporation dynamics of (Agx)+ clusters in which different number of Ag atoms are changed into AgI molecules are examined. Questions like how does the binding of an AgI polar molecule to the Ag+(x-1) cluster depends on its polarizability is to be answered. In addition, in clusters with more than one AgI molecule, do the polar molecules stay together or spread around the metallic part of the cluster? Do we get phase separation. What fraction of the Ag atom needs to be converted into AgI before phase separation between the metallic and the ionic part of the cluster occurs? Both theoretical and experimental studies are being carried on in order to understand this interesting system. How much a cluster like [Cs(CsI)14]+ is destabilized by introducing defects created by substituting one or more of the CsI molecules with another alkali halide molecules of different size (e.g. in [Cs(CsI)13 ◊ RbI]+? By studying the evaporation dynamics of the mixed cluster one can determine its relative rates of evaporation to give CsI or RbI from the relative mass peak intensity of the corresponding daughter ions. By assuming the absence of barriers for the condensation process (which involves ion-dipole interaction), one can deduce from the kinetic data thermodynamic quantities from which the effect of impurity (RbI) substitution on the stability of the parent cluster can be determined. Furthermore, the energy difference between different “isomers” (resulting from the different sites that the RbI molecule(s) can occupy) can be determined. Using a modified polarizable electrostatic model of Martin et al., one can calculate the internal energies of these mixed clusters, as is done for pure clusters. A careful test of the model can be accomplished by calculating these small energy differences and comparing them to experiments. Using Mass spectrometric techniques, the stability of dication metallic clusters is examined. The critical cluster size below which the cluster is unstable towards Coulombic explosion will be determined for different metal dication clusters. The effect of adding different atoms, e.g., halogens, on the stability of present clusters will be examined. Theoretical predictions of the critical size will be tested and more understanding of the cluster structures and the mechanism of their explosion will be accomplished. Bacteriorhodopsin, a retinal protein membrane present in halobacterium halobium, is the other photosynthetic system in nature besides chlorophyll. Upon the absorption of light, it rapidly isomerizes leading to charge separation. The system then goes through a photocycle with a minimum of six intermediates before it returns to its original state. As a result, protons are pumped from inside the cell to the membrane surface, thus converting solar to electric energy, which is used in ATP synthesis. We and others have shown that the primary process in bR photocycle is indeed a retinal photoisomerization. It occurs extremely rapidly on the 0.5 ps time scale and only around the C13 - C14 bond. In solution, this process occurs on the nanosecond time scale and is not so highly specific. The question immediately arises regarding the molecular mechanism(s) by which the protein catalyzes this process and makes it so highly specific in bR (as well in rhodopsin). In order to answer these questions, we are involved in two types of studies. In one, the rate of retinal isomerization of a number of mutants in which individual charged or hydrogen bonding amino acids are genetically replaced by nonhydrogen bonding neutral ones. This work is done in collaboration with Professor J. Lanyi of U.C. Irvine who prepares the different mutants. In the second type of studies, the somerization of bound modified retinals (synthesized by Professor R. Liu of the University of Hawaii) are measured. The aim of these studies is to separate the effect of electrostatic interactions from the indirect sterric effects within the cavity as a factor in the catalyses and the specificity of the protein to the photoisomerization process. The removal of metal cations from bR inhibits the proton pumping function. The question thus arises as to their role in making the molecular pump work. A detailed study of the binding sites of the metal cations is underway. The importance of negatively charged amino acids (aspartates and glutamates) and hydrogen bonding residues to the binding is examined by a systematic genetic replacement of each of the important ones and examining the effect on the value of the binding constants of the different sites. After the binding characteristic is understood, the effect of metal cation on the dynamical structuralproperties will begin. In these studies, an examination of the effect of binding of metal cations on the FTIR spectrum of bacterio-opsin and its mutants will be examined. In this manner, the amino acids most directly affected by the binding could be identified. A detailed examination of the effect of different metal cations on the energy and entropy of activation of both the deprotonation process as well as the proton transport process to the surface will be carried out. The latter will be extracted from the temperature dependence of the change of color of pH sensitive dyes attached to an amino acid at the opening of the proton chanel. A final determination of the location of metal cations in bR will be made by use of anamolous x-ray scattering in Brookhaven National Lab. In this work, metal cations whose K or L resonances are in the x-ray wavelength range taken of BNL synchrotron facility will be used. By subtracting the diffraction pattern obtained off from that on resonance only the scattering from the metal cations will be determined. If we do this experiment as one gradually fills in the different sites, it is hoped that the location of the different binding sites can be determined from the two dimensional projection map obtained from these studies. The results of the FTIR studies should be helpful in this complex effort. The following research projects are carried out in the Laser Dynamics Laboratory (LDL) directed by Professor El-Sayed (http://ldl.gatech.edu). LDL houses the most recent lasers and laser spectroscopic equipment for time resolved optical, Raman and IR studies. It also houses biochemical labs equipped with cell culture facilities, modern facilities of plasmonic imaging in time the single cells and their contents using either SERS spectra or Rayleigh images during the cell full life (between birth to division) or as it dies. Available for LDL researchers the use of the Georgia Tech clean room facilities with its High resolution TEM, electron-beam facilities for the synthesis of nanoparticles of different shapes, and its high resolution structural determination facilities. The present research interests are focused on the synthesis, the determination of the structure and the properties of materials (semiconductor and metallic nanoparticles) of sizes confined to the nanoscale (between one and 100 nm). Applications in different technical fields ranging from nanpcatalysis, nanosensors to cancer nano medicine and moleculat cell-biology were developped and used. Over the past twenty years, El-Sayed and his group have made unparalleled contributions to the fields of nanoscience and nanotechnology . Figure1 below (taken in July of 2014 from Google Scholar citation): http://scholar.google.com/citations?user=BMpDLscAAAAJ&hl=en) shows the dramatic change in the annual number of citations with time of the published papers by his group before and after changing his research activity to the nanoscience field (in the mid-ninety). It also shows the large change in his h-index in the last five years, when the impact of focusing his nano-science research on nano-medicine and cancer research (the developing different techniques using gold and silver nanoparticles in the diagnosis, therapy and studying on single cell of cancer). Fig 1. 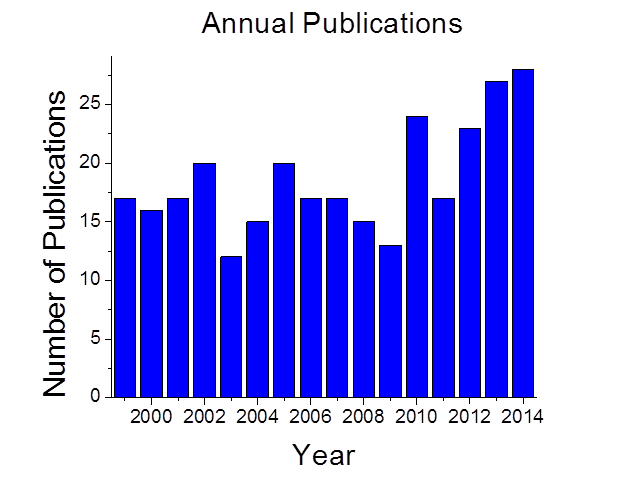 The annual number of citations to El-Sayed’s group publications before and after getting into the nanoscience research in the late nineties until mid of 2014(Scholar.google.com/citations). Fig 2. El-Sayed’s group annual publications in the nanoscience research field until mid July of 2014. He and his group have published more than 670 articles total by the mid of 2014 with half of this appeard in the last twenty years (The number of citations per paper published in the past few years has been in the hundreds (See the large exponential increase in the citations to his research papers in this period in fig1 and the number of published papers in fig 2). On Jan. 29, 2010 - the Laser Dynamics Laboratory (LDL) ( see http://ldl.gatech.edu/), whose director is Professor El-Sayed, was ranked #4 Worldwide among Academic chemistry research labs of the past decade by the Times Higher Education. LDL publications garnered an impressive 75.74 citations per paper over this period. On March 21, 2011, the Laser Dynamics Laboratory was ranked #17 worldwide among all chemistry research labs (Academic, National as well as the Industrial labs) during the past decade (2000-2010) by the Thomson Reuters. During this period. LDL published more highly cited manuscripts than any others in the top 20. Below we will describe some of the LDL to nanoscience and its important impact on technology. Three fields this group has studied and obseved new nano-scientific properties with some are shown to have important impact on the field of Nanotechnology. 3.MA El-Sayed, Some interesting properties of metals confined in time and nanometer space of different shapes, Accounts of Chemical Research 34 (4), 257-264,2001 INVITED (2080 citations). 5. Shape-controlled synthesis of colloidal platinum nanoparticles, TS Ahmadi, ZL Wang, TC Green, A Henglein, MA El-Sayed, SCIENCE-1924-1925, 1996 (2013 citations). The type of electronic motion in matter determines its property and thus its uses in our everyday life.This motion itself is determined by the forces acting on the electrons and thus the space in which they are allowed to move. The difference between a metal, a semiconductor and an insulator lies in the fact that the electronic motion is highly delocalized, slightly confined, and highly confined, respectively. One thus expects that if we reduce the size of material to below its naturally allowed characteristic length scale new properties should be observed which are different from that of the macroscopic material as well as of their building blocks (atoms or molecules). This size is on the nanometer length scale. The type of electronic motion in matter determines its property and thus its uses in our everyday life. This motion itself is determined by the forces acting on the electrons and thus the space in which they are allowed to move. The difference between a metal, a semiconductor and an insulator lies in the fact that the electronic motion is highly delocalized, slightly confined, and highly confined, respectively. One thus expects that if we reduce the size of material to below its naturally allowed characteristic length scale new properties should be observed which are different from that of the macroscopic material as well as of their building blocks (atoms or molecules). This size is on the nanometer length scale. Different methods are developed to synthesize, reshape and study the self-assembly characteristics of gold, silver and transition metal nanoparticles. High resolution TEM is used to follow the shape distribution and their dependence on the preparation condition and to study their thermal stability. From the results, themechanism of shape controlled growth and self-assembly are elucidated. Metallic nanoparticles of non-spherical shape have been found to undergo a sharp transformation into the more thermodynamically stable spherical shape induced by pulsed laser excitation. A study is directed to understand mechanism and relevant time scales involved in this photothermal shape transformation. By adjusting the power and wavelength of the pulsed laser, the size and shape distribution of non-spherical nanoparticles can be changed and the nanoparticles can be reshaped. Three methods are used for the assembly of metallic nanoparticles: 1) From colloidal solution of highly mono-dispersed sample, 2) Nanosphere lithography, and 3) Electron beam Lithography. Metallic nanoparticles assembled in monolayer periodic arrays present opportunities to study both unique properties of individual nanoparticle and collective properties of coupled nanoparticles. The current fundamental research in the Laser Dynamics Laboratory on metallic nanoparticle arrays includes: 1) Ultrafast dynamics of coherent vibration induced by femtosecond laser; 2) Effects of electronic coupling between nanoparticles on the optical and electronic properties; 3) Medium effects on electron-phonon and phonon-phonon dynamics. 4) The laser photothermal heating of gold and silver nanoparticles can result in the heating or melting of the medium surrounding the nanoparticle. Alternately, the nanoparticles may themselves melt or atomic ablation may take place. We are studying the dependence of the nature of photothermal heating of gold and silver nanoparticles on the rate of heat deposition by varying the photothermal laser pulse energy and the pulse duration as well as the effect of cw laser on photo-thermal destruction of cancer cells. The laser photothermal heating of gold and silver nanoparticles can result in the heating nanoparticles may themselves melt or atomic ablation may take place. We are studying the dependence of the nature of photothermal heating of gold and silver nanoparticles on the rate of heat deposition by varying the photothermal laser pulse energy and the pulse duration biological cell for possible cancer cell treatment. Nanoparticles are potentially attractive catalysts since they have a large surface-to-volume ratio and high surface energy compared to bulk catalytic materials. In addition, metal nanoparticles of different shapes have different crystallographic facets and different fraction of atoms located on their corners and edges, which makes it interesting to study the effect of nanoparticle shape on the catalytic activity of various reactions. It is also important to note that having very active surface atoms could make the nanoparticles unstable during the course of its catalytic function. In the case of the early stages of the electron transfer reaction, we found that tetrahedral platinum nanoparticles are the most catalytically active and have the greatest fraction of surface atoms on their corners and edges, while the cubic platinum nanoparticles are the least catalytically active and have the lowest fraction of surface atoms on their corners and edges. During the full course of the reaction (2 days), it is observed that distortions in the corners and edges of both the tetrahedral and cubic platinum nanoparticles take place. In addition, the rate of dissolution of corner and edge atoms is found to be faster for the tetrahedral nanoparticles. As the catalytic reaction continues in colloidal solution, shape changes take place eliminating sharp edges and corners (to eventually make spherical shape). Radha Narayanan and Mostafa A. El-Sayed, Journal of Physical Chemistry B, 2004, 108(18), 5726-5733; Radha Narayanan and Mostafa A. El-Sayed, Journal of the American Chemical Society, 125(27), 8340-8347 (2005). heating or melting of the medium surrounding the nanoparticle. 1.TS Ahmadi, ZL Wang, TC Green, A Henglein, MA El-Sayed, Shape-controlled synthesis of colloidal platinum nanoparticles, , SCIENCE, 1924-1925,1996 (2006 citations). 2. Mahmoud A Mahmoud , Narayanan, R.; El-Sayed, M. A., Enhancing Colloidal Metallic Nanocatalysis: Sharp Edges and Corners for Solid Nanoparticles and Cage Effect for Hollow Ones, Acc Chem Res, (2013).A , Acc Chem Res. ,46, 1795-805.2013. 3. Li, Y.; Hong, X. M.; Collard, D. M.; El-Sayed, M. A. Suzuki Cross-Coupling Reactions Catalyzed by Palladium Nanoparticles in Aqueous Solution. Organic Letters 2000, 2, 2385-2388. 4. Mahmoud, M. A.; Saira, F.; El-Sayed, M. A. Experimental evidence for the nanocage effect in catalysis with hollow nanoparticles. Nano letters 2010, 10, 3764-3769. 5. Burda, C.; Chen, X. B.; Narayanan, R.; El-Sayed, M. A. Chemistry and properties of nanocrystals of different shapes. Chemical Reviews 2005, 105, 1025-1102. 6. Narayanan, R.; El-Sayed, M. A. Shape-Dependent Catalytic Activity of Platinum Nanoparticles in Colloidal Solution. Nano Letters 2004, 4, 1343-1348. 7. Mahmoud, M. A.; Tabor, C. E.; El-Sayed, M. A.; Ding, Y.; Wang, Z. L. A new catalytically active colloidal platinum nanocatalyst: the multiarmed nanostar single crystal. Journal of the American Chemical Society 2008, 130, 4590-4591. 8. Narayanan, R.; El-Sayed, M. A. Changing Catalytic Activity during Colloidal Platinum Nanocatalysis Due to Shape Changes: Electron-Transfer Reaction. Journal of the American Chemical Society 2004, 126, 7194-7195. 9. Mahmoud, M. A.; Narayanan, R.; El-Sayed, M. A. Enhancing colloidal metallic nanocatalysis: sharp edges and corners for solid nanoparticles and cage effect for hollow ones. Accounts of chemical research 2013, 46, 1795-1805. 10. Mahmoud, M. A.; El-Sayed, M. A. Time dependence and signs of the shift of the surface plasmon resonance frequency in nanocages elucidate the nanocatalysis mechanism in hollow nanoparticles. Nano letters 2011, 11, 946-953. 11. Yen, C. W.; Mahmoud, M. A.; El-Sayed, M. A. Photocatalysis in Gold Nanocage Nanoreactors†. The Journal of Physical Chemistry A 2009, 113, 4340-4345. 12. Mahmoud, M. A.; Qian, W.; El-Sayed, M. A. Following Charge Separation on the Nanoscale in Cu2O–Au Nanoframe Hollow Nanoparticles. Nano letters 2011, 11, 3285-3289. When photons interact with nanoscale materials (semiconductor and metal), many new physical phenomena will be observed which are not present in corresponding bulk materials. Nanophotonics provides opportunities for making ultra-small optoelectronic devices which have great performance in lasing, sensing, and communication. In our group, we have made two-dimensional metallic nanoprism arrays with well-defined size, shape, and interparticle separation using nanosphere lithography technique. These samples could be used in surface-enhanced spectroscopy, plasmonic devices, and sensors due to its tunable optical properties. We have observed modulation of the color of plasmonic nanoparticles with coherent lattice vibration due to the dependence of the surface plasmon frequency on lattice volume change with the modulation period proportional to the size of nanoparticle. SEM images (Left) of the prismatic silver (a-c) and gold (d-f) nanoparticles monolayer arrays (in white color) made with nanosphere lithograph technique and the absorption spectra (Right) of the silver (a) and gold (b) periodic array samples made with the 0.26 (blue spectrum), 0.36 (green spectrum) and 0.45 μm (red spectrum) PS spheres, respectively. Expected dependence of surface plasmon absorption spectra on volume during the lattice oscillation of a gold or silver nanoparticle. Optically detected lattice phonon oscillations induced in the prismatic Ag (a,b,c) and Au (d,e,f) nanoparticles monolayer arrays with a 100 fs laser pulse at 400 nm and monitored near the absorption maximum of each nanoparticle (solid dots). The size (bisector) of the silver nanoparticles is around (a) 52.4, (b) 79.6 and (c) 99.3 nm. The size of the Au nanoparticles is around (d) 60.5, (e) 85.7 and (f) 103.7 nm. Wenyu Huang, Wei Qian and Mostafa A. El-Sayed , Nano Letters, 2004, 4 (9), 1741-1747; Wenyu Huang, Wei Qian and Mostafa A. El-Sayed , The Journal of Physical Chemistry B, 2005, 109 (40), 18881-18887. 1	Mahmoud, M. A. & El-Sayed, M. A. Aggregation of gold nanoframes reduces, rather than enhances, SERS efficiency due to the trade-off of the inter-and intraparticle plasmonic fields. Nano letters 9, 3025-3031 (2009). 2	Mahmoud, M. A. & El-Sayed, M. A. Gold nanoframes: Very high surface plasmon fields and excellent near-infrared sensors. Journal of the American Chemical Society 132, 12704-12710 (2010). 3	Mahmoud, M. A., Snyder, B. & El-Sayed, M. A. Surface Plasmon Fields and Coupling in the Hollow Gold Nanoparticles and Surface-Enhanced Raman Spectroscopy. Theory and Experiment†. The Journal of Physical Chemistry C 114, 7436-7443 (2010). 4	Mahmoud, M. A., O’Neil, D. & El-Sayed, M. A. Hollow and Solid Metallic Nanoparticles in Sensing and in Nanocatalysis. Chemistry of Materials 26, 44-58, doi:10.1021/cm4020892 (2013). 5	Mahmoud, M. A., Chamanzar, M., Adibi, A. & El-Sayed, M. A. Effect of the Dielectric Constant of the Surrounding Medium and the Substrate on the Surface Plasmon Resonance Spectrum and Sensitivity Factors of Highly Symmetric Systems: Silver Nanocubes. Journal of the American Chemical Society 134, 6434-6442 (2012). 6	Mahmoud, M. A. & El-Sayed, M. A. Substrate Effect on the Plasmonic Sensing Ability of Hollow Nanoparticles of Different Shapes. The Journal of Physical Chemistry B 117, 4468-4477 (2013). 7	Mahmoud, M. A. & El-Sayed, M. A. Different plasmon sensing behavior of silver and gold nanorods. The Journal of Physical Chemistry Letters 4, 1541-1545 (2013). The most useful and important contributions of El-Sayed’s group to nanoscience that best impacted Nanotechnology is indeed to the field of medicine and molecular cell biology. Their early results on the plasmonic properties of gold and silver nanoparticles (1,2, 3,4) enabled them to use what they found to develop methods for cancer diagnostic (5) and photothermal therapy (6). In order to use the property of gold nanoparticles in photothermal therapy in which moderately strong light is absorbed, converted into intense scattered light used in imaging applications or some of it is converted into high temperature heat used in the photo-thermal selective destruction of the cancer or any diseased cells. Only near infra-red light can penetrate long distances in the human body. Nanorods are known to absorb in the near IR at different wavelengths depending on the rods aspect ratios. We developed (7) the best synthetic method to make the nanorods. This method is now the most used method for making the nanorod for use in photothermal and many other photonic applications Worldwide. This synthetic publication has won the most cited and most downloaded paper of the American Chemical society “Chemistry of mateial” journal every year for the past six years. El-Sayed received five years funding from the National institute of Health (NIH) to use the gold nanorods in photo-thermal cancer therapy in animal studies jointly with the assistant to the director of the Winship Cancer Institute of Emory University Medical School in Atlanta. In addition, El-Sayed is directing a30-scientists research group at the Egyptian Research Center in Cairo, Egypt, funded by an Islamic group (Misr El-kheir) using the Zakah funds collected to help good causes for suffering people in Egypt, like those fighting cancer. These two studies are now in progress in Egypt and United States. In another direction, the El-Sayed group has developed a spectroscopic technique making use of the strong imaging power of the enhanced scattering properties of gold or silver nanoparticles to image single cell behavior (using enhanced Rayleigh type scattering) or the molecular changes anywhere in a live single cell (using Surface Enhanced Raman Scattering, SERS and specific conjugation techniques). More important, these studies can be carried out in time during the cell lifetime, during its division or as the cell dies8 from any disease or as it is treated with any drug . 2.MA El-Sayed, Some interesting properties of metals confined in time and nanometer space of different shapes, Accounts of Chemical Research 34 (4), 257-264,2001 INVITED (2080 citations). 5. El-Sayed, Ivan; Huang, Xiaohua; El-Sayed, Mostafa A., “Surface Plasmon Resonance Scattering and Absorption of anti-EGFR Antibody Conjugated Gold Nanoparticles in Cancer Diagnostics; Applications in Oral Cancer,” Nano Letters 4 (5), 829-834, (2005). 6. Huang, X., El-Sayed, I. H., Qian, W. and El-Sayed, M. A. “Cancer Cell Imaging and Photothermal Therapy in the Near-Infrared Region by Using Gold Nanorods,” Journal of the American Chemical Society, 128 (6), 2115-2120, (2006). growth method, Nikoobakht, MA El-Sayed Chemistry of Materials 15 (10), 1957-1962 (the most cited and downloaded paper in the ACS chemistry of materials Journal for the past several years). 8.B.Kang,L.A,Austinand M.A.El-Sayed. (2012, Real-TimeMolecular Imaging throughout the Entire Cell Cycle by Targeted Plasmonic-Enhanced Rayleigh/Raman Spectroscopy. Nano Letters 12, 5369-5375. Owing to their characteristic Localized Surface Pllasmon Resonance (LSPR), gold nanoparticles (AuNPs) which results from the absorption of light with resonant frequency and induce the coherent motion of the its conduction band electrons. This produces large surface electromagnetc fields. These decay either by giving off strongly enhanced light scattering (used for imaging) or via nonradiative processes (heat) resulting from the collisions between the excited oscillating electrons and the ionic lattice of the gold or silver metals (electron-phonon relaxation processes). We measured this to occur in the one picosecond timescale. We measured the time the hot metallic particle transfer its thermal energy to the surrounding (i.e. to the cancer cell to which it is attached) to be in the few hundreds of picoseconds resulting in its melting and destruction(1). The ability of these particles to heat the surrounding medium upon excitation, along with the sensitivity of cancer cells to hyperthermia, is exploited in the cancer treatment by the method we called the plasmonic photothermal therapy (PPTT) therapy. Plasmonic AuNPs are ideal candidates as photothermal contrast agents. They can be specifically attached to cancer cells via molecular targeting or systemically delivered to tumor sites via the enhanced permeability and retention (EPR) effect. Upon accumulation of the AuNPs at the disease site of interest, they can be triggered via external radiation, causing temperature increases characteristic of hyperthermia, and subsequently inducing apoptosis. Not only can the AuNPs target the disease site of interest for targeted PPTT, but their LSPR is tuned such that the particles can be triggered by near-infrared (NIR) light (650–900 nm) that easily passes through physiological tissues with minimal interference with water or the hemoglobin. Our group demonstrated successful destruction of human oral squamous carcinoma cells (HSC-3), by selectively labelling them with antiEGFR conjugated AuNPs and irradiating them with a continuous wave (cw) visible laser to induce cell death (2). We later demonstrated the use of AuNRs for the NIR-triggered PPTT of HSC-3 tumor cells. Initially, we used antibody-conjugated AuNRs for the selective labeling of cancer cells in vitro. (3) Upon attachment of these photothermal contrast agents to the cell membrane, near IR light (NIR) laser exposure activated the AuNRs, such that they released enough heat to induce membrane destruction in the labeled cancer cells leaving the healthy cells unaffected. After receiving the National institute of health funding in the USA, our group with the group of Dr Shin of Emory cancer center used this same technique into the in vivo regime, utilizing PEG-AuNRs that were not specific for cellular labeling, but were biocompatible and able to accumulate in HSC-3 tumor tissue due to the EPR effect. (4) These photothermal contrast agents were systemically delivered to mice, allowed to accumulate in tumor tissue, and then selectively activated via NIR laser irradiation, resulting in dramatic reduction in tumor growth. Recently, we demonstrated the optimization of AuNR-mediated PPTT (in vitro) by altering the AuNR’s optical properties through nanoparticle size manipulation.(5). At the same time, two groups of Scientists at NRC in Cairo Egypt are doing studies on Mice and Rats and now moving to do it on Dogs. El-Sayed go to Egypt four times a year to give seminars and to direct the research at NRC and getting the NRC group in continuous contact with medical doctors at the National Cancer Center in Cairo. The minister of Health in Cairo is kept informed with the results of these groups and is kept informed by Professor El-Sayed with the progress in this field..
1. Link, S, and El-Sayed, MA. Optical properties and ultrafast dynamics of metallic nanocrystals. Annu Rev Phys Chem 2003; 54: 331-366. 2. El-Sayed, IH, Huang, X, and El-Sayed, MA. Selective laser photo-thermal therapy of epithelial carcinoma using anti-EGFR antibody conjugated gold nanoparticles. Cancer Lett 2006; 239: 129-135. 3. Huang, X, El-Sayed, IH, Qian, W, and El-Sayed, MA. Cancer cell imaging and photothermal therapy in the near-infrared region by using gold nanorods. J Am Chem Soc 2006; 128: 2115-2120 (this paper was the most cited paper in that year in the Journal of the American Chemical Society). 4. Dickerson, EB, Dreaden, EC, Huang, X, El-Sayed, IH, Chu, H, Pushpanketh, S, et al. Gold nanorod assisted near-infrared plasmonic photothermal therapy (PPTT) of squamous cell carcinoma in mice. Cancer Lett 2008; 269: 57-66. 5. Mackey, MA, Ali, MR, Austin, LA, Near, RD, and El-Sayed, MA. The most effective gold nanorod size for plasmonic photothermal therapy: theory and in vitro experiments. J Phys Chem B 2014; 118: 1319-1326. The use of the plasmonic (strong scattering and photo-thermal) properties of gold and silver nanoparticles made Nanotechnology a naturally growing field due to its integration into many biomedical applications. Within nanotechnology, gold nanoparticles (AuNPs) are some of the most heavily utilized nanomaterials due to their unique optical, physical and chemical properties. In particular, their enhanced light scattering provides several advantages when used in biological imaging or as sensing agent. When compared to commonly used fluorophores, AuNPs’ scattered light is 4-5 orders of magnitude brighter. Our group has made use of the enhanced light scattering, to not only image cellular environments, but also to continually observe real-time intracellular molecular changes during various cellular processes. In 2010, AuNP scattering in conjunction with dark field imaging was used to determine particle localization at the nucleus and to monitor cellular response after a cytotoxic level of AuNPs were delivered. This foundational work was expanded upon in 2012, as non-cytotoxic concentrations of nuclear-targeted AuNPs were used to probe the real-time molecular changes at the nucleus during cell cycle progression. In particular, AuNP scattering was exploited to simultaneously acquire structural and molecular information from a single-cell through Rayleigh and Raman imaging, and revealed a strong correlation between DNA and protein Raman vibrations and cell cycle phase progression. Intracellular AuNP coupled Raman spectroscopy was also used to determine drug efficacy and drug delivery in cancer cells after treatment with chemotherapeutic agents. [4, 5] This work demonstrated the ability of AuNP light scattering to continually assess the efficiency of drug delivery and drug efficacy in real-time as well as reduced the time required to obtain cytotoxicity drug profiles. Moreover, nuclear AuNP scattering and Raman spectroscopy were used to reveal real-time molecular changes in human cancer cells during apoptosis6. The ability to directly compare morphological changes (i.e. Rayleigh scattering images) with molecular changes (i.e. Raman spectroscopy analysis) of the DNA/protein composition around the cell nucleus revealed the occurrence and dynamics of three apoptotic molecular events: protein denaturation, proteolysis, and DNA fragmentation. A temporal profile of these molecular events was also created. Together, these results concluded apoptotic cell death mechanism and demonstrated the potential of AuNP scattering to advance molecular and cellular biology methods to accurately assess therapeutic imaging and response. By loading large number of drug molecules on nanoparticle surfaces and deliver them to the sick cell it kills the cell instantaneously minimizing the possibility of drug resistance to accur. The only question raised when this does not happen is whether or not the drug was actually delivered by being released from the surface of the nanoparticle. Due to their unique optical and physical properties,7 plasmonic nanoparticles, specifically of gold nanoparticles have been heavily utilized in biomedical applications. Recently, we have employed gold nanoparticles to not only deliver the chemotherapeutic drug doxorubicin, but to also monitor its delivery in real-time using a new technique termed plasmonically-tunable Raman/fluorescence imaging spectroscopy (P-TRFIS).8 This technique exploits the ability of gold nanoparticles to selectively turn “ON” or “OFF” Raman and fluorescence signals based upon the drug molecules distance from the nanoparticle surface. Doxorubicin (DOX), a common chemotherapeutic drug, was covalently attached to the gold nanoparticle surface using a pH-sensitive hydrozone linkage that is susceptible to cleavage in acidic environments, such as present in the cell lysosomes. When the DOX-gold nanoparticle conjugate is initially administered to cancer cells, the Raman signals of DOX are greatly enhanced, while its fluorescence is quenched due to its proximity to the plasmonic field of the nanoparticles. Once the drug-nanoparticle conjugated entered the lysosome, the DOX is released from the nanoparticle resulting in the restoration of its fluorescence intensity and the disappearance of its Raman spectra. as it moves away from the thenanoparticle plasmoic field. By simultaneously tracking the intensity of the fluorescence and Raman spectra of DOX functionalized gold nanoparticles, we were able to monitor the drug delivery in real-time on the single cell level ! 1. P. K. Jain, X. H. Huang, I. H. El-Sayed and M. A. El-Sayed. (2008) Noble Metals on the Nanoscale: Optical and Photothermal Properties and Some Applications in Imaging, Sensing, Biology, and Medicine. Accounts of Chemical Research 41, 1578-1586. 2. B. Kang, M. A. Mackey and M. A. El-Sayed. (2010) Nuclear Targeting of Gold Nanoparticles in Cancer Cells Induces DNA Damage, Causing Cytokinesis Arrest and Apoptosis. Journal of the American Chemical Society 132, 1517-1519. 3. B. Kang, L. A. Austin and M. A. El-Sayed. (2012) Real-Time Molecular Imaging throughout the Entire Cell Cycle by Targeted Plasmonic-Enhanced Rayleigh/Raman Spectroscopy. Nano Letters 12, 5369-5375. 4. L. A. Austin, B. Kang and M. A. El-Sayed. (2013) A New Nanotechnology Technique for Determining Drug Efficacy Using Targeted Plasmonically Enhanced Single Cell Imaging Spectroscopy. Journal of the American Chemical Society 135, 4688-4691. 5. B. Kang, M. M. Afifi, L. A. Austin and M. A. El-Sayed. (2013) Exploiting the Nanoparticle Plasmon Effect: Observing Drug Delivery Dynamics in Single Cells via Raman/Fluorescence Imaging Spectroscopy. ACS Nano 7, 7420-7427. 6. B. Kang, L. A. Austin and M. A. El-Sayed. (2014) Observing Real-Time Molecular Event Dynamics of Apoptosis in Living Cancer Cells using Nuclear-Targeted Plasmonically Enhanced Raman Nanoprobes. ACS Nano 8, 4883-4892. 7. Jain, P. K.; Huang, X. H.; El-Sayed, I. H.; El-Sayed, M. A. Accounts of Chemical Research 2008, 41, (12), 1578-1586. 8. Kang, B.; Afifi, M. M.; Austin, L. A.; El-Sayed, M. A. ACS Nano 2013, 7, (8), 7420-7427. Gold nanoparticles exhibit a combination of physical, chemical, optical, and electronic properties unique from other biomedical nanotechnologies and provide a highly multifunctional platform with which to image and diagnose diseases, to selectively deliver therapeutic agents, to sensitize cells and tissues to treatment regimens, to monitor and guide surgical procedures, and to preferentially administer electromagnetic radiation to disease sites1, 2. Because of their large size, circulating nanoparticles preferentially accumulate at tumor sites and in inflamed tissues due to the characteristically defective architecture of the vessels which supply oxygen and nutrients to these tissues. Once circulating nanoparticles extravasate through these large vascular pores and into the disease site, they remain lodged due characteristically diminished lymphatic drainage and their low diffusivity. Gold nanoparticles can be used to deliver drugs or imaging contrast agents that otherwise exhibit poor solubility or pharmacokinetic profiles, or to deliver agents which are intrinsically susceptible to enzymatic degradation and/or exhibit poor intracellular penetration such as small interfering RNA (siRNA). Nanogold can be routinely surface functionalized with active ligands at densities that are 100- and 1000-fold higher than that achievable with conventional liposomes or PLGA nanoparticles, respectively, allowing their binding affinity to be optimized for a particular disease, type, stage, or patient. Because of their comparability in size to the distances between cell-surface targets, gold nanostructures can simultaneously engage multiple, adjacent receptor sites, achieving increased selectivity in their uptake through this multivalent avidity. The novel optical and electronic properties of gold nanoparticles are also particularly attractive for use in multimodal drug delivery applications where these structures can afford enhanced drug pharmacokinetics/biodistribution and simultaneous hyperthermia and radiation therapy contrast, as well as photo-imaging contrast, spectro-chemical diagnostic contrast, and, when molecularly directed to specific sub-cellular sites, intrinsic pharmaco-dynamic properties. Thus Biomedical Research in El-Sayed Lab is aimed to leverage the unique structural, optical, and electronic properties of gold nanotechnologies to improve cancer diagnostics and therapy and to understand molecular cell biology. These strategies broadly emphasize the development of nanoscale tools for (i) molecularly-targeted cancer diagnostics, (ii) laser-photo-thermal tumor therapy, and (iii) understanding the fundamental interactions of nanoscale materials with biological systems. Early studies in his laboratory asked whether the unique optical properties of gold nanoparticles could be used to more easily discriminate cells based on the presence or absence of cellular biomarkers. Using antibody-gold nanoparticle conjugates targeting the cell-surface receptor, EGFR, they found that malignant cells could be selectively labeled with gold nanoparticles in vitro, providing high optical scattering contrast for identification using a simple light microscope or optical spectrometer.3 In later work they extended this approach to develop multivalent analogues of small molecule inhibitors that block cancer cell signaling.4 They found multivalent display improved drug performance several fold per drug molecule and could be extended to a variety of other therapeutic cell signaling cascades. Another aspect of his research asks whether targeted gold nanoparticle delivery can facilitate improved cancer diagnostics and therapeutics in vivo. By designing rod-shaped gold nanoparticles capable of absorbing tissue-penetrating light waves and converting them into heat, they were able to show, for the first time, that gold nanorods could serve as efficient and systemically administerable contrast agents for laser photothermal tumor therapy.5 They observed 2-4 fold increased heating in nanoparticle-treated tumors, resulting in 50% complete remission in a mouse cohort receiving their optimized treatment protocol. Extending this approach, they have also studied how electromagnetic enhancement by gold nanoparticles can augment cell killing in photodynamic therapy, where photoexcitation of small molecule ‘photosensitizers’ leads to the formation of toxic oxygen species. By tailoring gold nanoparticle size/shape to facilitate resonant electronic interaction with the photosensitizer, they were able to improve cell killing by up to 200-fold while greatly decreasing dose-limiting toxic effects. In parallel, their research also seeked to better understand the ways that nanoscale materials can interact with and manipulate biological systems. By molecularly targeting gold or silver nanoparticles to discrete sub-cellular locations, they found that they can not only selectively perturb various biological process,6 but also monitor in real-time7 their dynamics via using rationally-designed nanoparticles that enhance, for example, Raman scattering or fluorescence quenching8. To summarize, El-Sayed’s group biomedical research interfaces biomolecular recognition with the unique optical and electromagnetic properties of nanoscale noble metals, in particular, gold due to its nontoxic properties. These investigations seek to improve cancer detection and drug potency, while also developing new methods for remediating solid tumors and manipulating biological systems via nanoscale technologies. In addition, El-Sayed is now supervising two groups, one in the states and supported byNIH and another one in Egypt supported by the people of Egypt. In this work, the positive results his group obtained in the in-vitro cell experiments are being extended to cancer-ridden animals e.g. mice, rats and now dogs. 1. Giljohann, D.A. et al. Gold Nanoparticles for Biology and Medicine. Angew. Chem. Int. Ed. 49, 3280-3294 (2010). 2. Dreaden, E.C., Alkilany, A.M., Huang, X., Murphy, C.J. & El-Sayed, M.A. The Golden Age: Gold Nanoparticles for Biomedicine. Chem. Soc. Rev. 41, 2740-2779 (2012). 3. El-Sayed, I.H., Huang, X. & El-Sayed, M.A. Selective laser photo-thermal therapy of epithelial carcinoma using anti-EGFR antibody conjugated gold nanoparticles. Cancer Lett.239,129-135 (2006). 4. Dreaden, E.C., Mwakwari, S.C., Sodji, Q.H., Oyelere, A.K. & El-Sayed, M.A. Tamoxifen-Poly (ethylene glycol)-Thiol Gold Nanoparticle Conjugates: Enhanced Potency and Selective Delivery for Breast Cancer Treatment. Bioconjugate Chem. 20, 2247-2253 (2009). 5. Dickerson, E.B. et al. Gold nanorod assisted near-infrared plasmonic photothermal therapy (PPTT) of squamous cell carcinoma in mice. Cancer Lett. 269, 57-66 (2008). 6. Kang, B., Mackey, M.A. & El-Sayed, M.A. Nuclear Targeting of Gold Nanoparticles in Cancer Cells Induces DNA Damage, Causing Cytokinesis Arrest and Apoptosis. J. Am. Chem. Soc. 132, 1517-1519 (2010). 7. Kang, B., Austin, L.A. & El-Sayed, M.A. Real-Time Molecular Imaging throughout the Entire Cell Cycle by Targeted Plasmonic-Enhanced Rayleigh/Raman Spectroscopy. Nano Lett.12, 5369-5375 (2012). 8. B. Kang, M. M. Afifi, L. A. Austin, M. A. El-Sayed, “Exploiting the Nanoparticle Plasmon Effect: Observing Drug Delivery Dynamics in Single Cells via Raman/Fluorescence Imaging Spectroscopy,” ACS Nano, 7 (8), 7420-7427 (2013).